Parents will be able to purchase in store or on-line; Birds is situated at Unit D, 13 Yaxham Road, Dereham NR19 1HB and on-line orders can be made at www.birdsofdereham.com. Birds will also be bringing their mobile shop to Bawburgh at least annually so parents can buy direct. This will probably be during the Summer Term so parents can order uniform ready for the winter months. On-line orders over £60 will be delivered directly to you free of charge; orders under this amount will incur a £5.00 charge but can be delivered to school free of charge for collection. Please quote BAW14 when ordering. 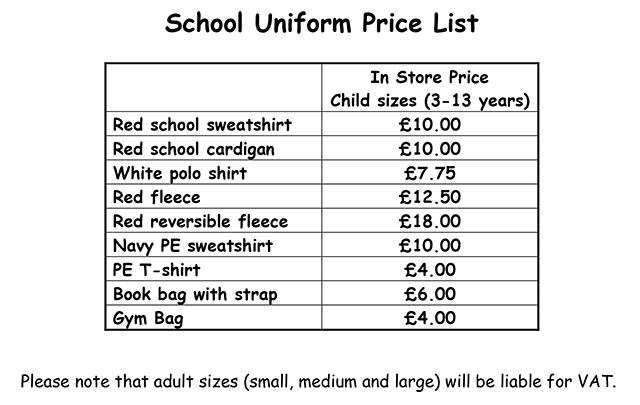 Please can you ensure that you order the correct coloured PE T Shirt.